Google Express: Need something in a hurry for your travels? Start your shopping on this page and save an additional $10 off your first order. Paintball USA: 2, 4, 6, or 12 Paintball Passes with Safety Gear and Gun Rental from Paintball USA Tickets (Up to 91% Off) Offer ends June 27, 2018. The Spa At Hilton Orlando: Spa Packages for One with Pool Access at the The Spa at Hilton Orlando (Up to 55% Off). Offer ends June 27, 2018. Putting Edge: $40 for One Round of Mini Golf for Four, With a Same-Day Second Round at Putting Edge ($74 Value). Offer ends June 27, 2018. Southwest Airlines: West coast California flights for as low as $39 each way. Offer ends June 27, 2018. Hawaiian Rumble Golf: Miniature Golf for Two or Four at Hawaiian Rumble Golf (Up to 49% Off). Offer ends June 27, 2018. Bob Evans: Get 20% off your check after 2pm with this Bob Evans coupon (in link) good through June 28, 2018. Jamba Juice: Get a free upgrade on your smoothie at Jamba Juice through Thursday, June 28, 2018. Aquatica Orlando: Buy single day tickets for $29 or single day ticket plus all-day dining for $49. Vouchers must be used by June 29, 2018. Offer expires June 29, 2018 or when offers no longer available. Bonefish Grill: Buy two entrees and get a free order of Bang Bang Shrimp with this Bonefish Grill coupon (see link) good through June 30, 2018. Caribee Bags: Sale on Caribee brand travel packs and wheeled luggage. Sale ends June 30, 2018. 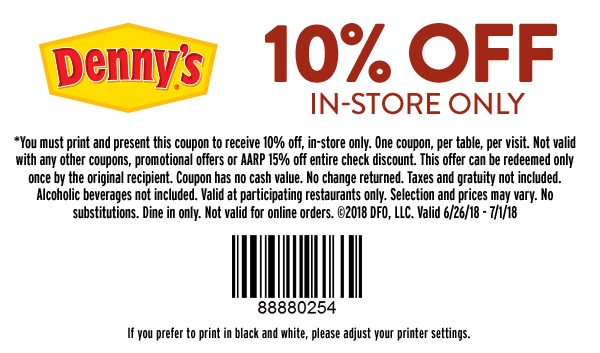 Denny’s: Get 10% off your check with coupon. Offer ends July 1, 2018. American Tourister: 30-70% of American Tourister backpacks, underseat, carry-on & huge variety of other bags. Sale ends Jule 2, 2018. Samsonite: Weekly Steal! Great deals on select Samsonite bags! Offer ends July 3, 2018. Olive Garden: Buy one entree and get another to take home for $4. Offer ends July 8, 2018. Red Lobster: Get 10% off your entire check. Offer ends July 8, 2018. Blazing Tomatoes: 10% off your meal, with coupon. Offer ends Oct. 31, 2018. Previous Previous post: What Can You Do When You Might Miss Your Connecting Flight?